MyVintage is using Smore newsletters to spread the word online. Chevrolet used to have an advertising campaign that touted, "Baseball, apple pie, and Chevrolet." Supposedly, General Motor's largest division attempted to indoctrinate consumers into believing that a Chevrolet was as mainstream as Main Street, USA. In many ways this campaign worked. For generations now the Chevrolet division has been serving up cars that have been snapped up by Americans, particularly those seeking their first car. Let's take a look at three Chevy classics that have shaped the respected US automaker. vintage chevrolet parts has some nice tips on this. Corvette - In 1953, the Chevy Corvette was released and the auto market hasn't been the same since. This two seat ragtop paved the way for greater and lesser cars to enter the US market including Chevy's own Camaro and Chevelle; Pontiac's Firebird and GTO; Ford's Thunderbird and Mustang; the Dodge Charger; Plymouth 'Cuda; AMC Javelin; Datsun 240Z; and a host of other cars. For over 50 years, the limited production Corvette has been the "halo" car for Chevrolet and is now a favorite of the baby boomer set. Camaro - One of the original "pony cars" was the Camaro which, along with the similarly designed Pontiac Firebird, was GM's answer in 1967 to the Ford Mustang. After the 1964½ introduction of the Mustang, GM needed a response...and badly! Pony cars were famous for compact size, speed, and 2+2 seating. Add in a convertible and you had a true California cruiser. After 35 years of production, Chevy discontinued the Camaro while the Mustang is still being made. Good news for Camaro fans: A new Camaro is reportedly set to debut for the 2009 model year. El Camino - Is it a car or is it a truck? How about: car/truck? Half car and half truck, the El Camino is essentially a car with the rear section converted into a truck bed. Introduced in 1959, the original El Camino was based on the Impala platform, then on the Chevelle, and later on the Malibu chassis. The El Camino was Chevy's response to the 1957 introduction of the Ford Ranchero, the first production car/truck. Although not meant for heavy duty truck use the El Camino, when equipped with adjustable shock absorbers, was able to carry its share of weight in its bed. The cars came with a choice of seven engines; a standard 235.5 cubic-inch 140-hp straight-six; 162-hp 265 cubic-inch V8, and eight versions of the 283 cubic-inch V8 with power ranging from 185 to 283 horsepower. 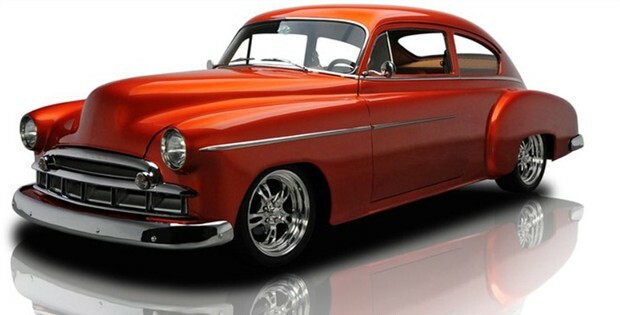 The 57 Chevy was the first American car with fuel injection. The optional 283 cubic-inch fuel-injected V8 produced 283 horsepower.